Stabilizing strap that attaches to the front and back of the main shoulder strap. Rapid Shoot Underarm Strap! Also work with all Black Raped products as well. 16" to 20.5" or 40cm to 52cm. Extendable from. The black, Classic Retro RS-4 Camera Strap commemorates BlackRapid's 10-year anniversary. It is designed to be worn across a right or left-handed user's body, draped from one shoulder to the opposing hip. A connected camera can then rest upside-down along the hip so that it can be quickly raised for use. Incorporating a moisture-wicking shoulder pad with a zippered pocket suitable for small accessories such as memory cards and batteries, this strap is built to provide most photographers with a comfortable and versatile carrying solution for one camera, regardless if it is worn over the left or right shoulder. The length of the Classic Retro RS-4 is adjustable from 29.0 to 66.0" and its webbing measures up to 1.0" wide. Curve Breathe. Designed to be worn across a right-handed user's body, draped from the left shoulder to the right hip. Adjustable 36.0 to 65.8" length with 1.0"-wide, nylon webbing. Integrated BRAD Breathe. Nylon Webbing, 65.7" Adjustable Length. JZS CC-20 Microfiber Cleaning Cloth. Webbing Material: 100% Nylon. Width of Webbing: 1 in. Length of Underarm Brad: 20 in. Lock Star Protector. The ProtectR comes in two sizes for a perfect fit. ProtectR - Regular is 17" (43.2 cm) and the ProtectR - Long is 21.5" (54.6 cm), for those who wear their straps extended a bit longer. The Breathe Double Slim is loaded with BlackRapid’s pro series features, including spring-loaded stability locks, Duraflex buckles, and Lockstar carabiner covers. The strap includes two FastenRs (FR-5), ConnectRs (CR-3), and Lock Star carabiner covers. The black, BlackRapid Cross Shot Breathe Camera Strap is designed to be worn across a right or left-handed user's body, draped from one shoulder to the opposing hip. A connected camera can then rest upside-down along the hip so that it can be quickly raised for use. This strap's 1.5" rubber-molded pad grips the shoulder, helping to keep the Cross Shot Breathe in place at all times, eliminating slips and maintaining peace of mind regardless if it is worn over the left or right shoulder. The Cross Shot Breathe's compact form factor is robust enough for heavy loads and spring-loaded bumper locks that can be slid up and down the length of the strap's nylon webbing make it especially easy to limit excess camera movement along the length of the Cross Shot Breathe. Extra FASTENR 5 (FR-5). FR-5 FastenR. The FR-5 FastenR Breathe is constructed from stainless steel with a nylon coating for durability. An included rubber washer can be used to prevent overtightening during installation to a compatible tripod mount. TheFR-5 Breathe FastenR fromBlackRapid is a mounting point for BlackRapid’s ConnectR locking carabiners. Flash & Lighting. Tripod Heads & Supports. Tethering Tools. Photo Accessories. iPhone & iPad Photo Gear. JZS CC-20 Microfiber Cleaning Cloth. Brad Breathe. Includes a Brad Breathe Stabilizing Strap. Webbing Material: 100% Nylon. Width of Webbing: 1 in. Strap Length with Pad: 65.7 in. It features a male side-release buckle on one end and an aluminum-alloy hook at the other. 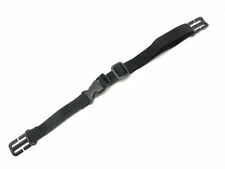 The Brad Breathe Stabilizing Strap is constructed from durable nylon. Stabilizing Strap. Brad Breathe. Buckle: Plastic. Material: Nylon; Brass and zinc alloy. Strap Length: 8.9" (22.5 cm). Strap Width: 1” (2.54 cm). Flash & Lighting. Photo Accessories. iPhone & iPad Photo Gear. Gear Protection. Demo Delights. Caribiners: Includes one 60mm yellow carabiner and one 70mm black carabiner made of anodized Aluminum. Kit Includes Flash & Lighting. Stuff Sack: Drawstring bag sized to fit an iPhone and made of smooth microfiber suitable for cleaning lenses and smartphone displays. BlackRapid Breathe Backpack Camera Strap. TheBert Breathe fromBlackRapid is a clip-on strap extender accessory for your Black Rapid Strap. This 100% Nylon webbed strap adds 12” to the length of any Breathe-series strap with a side-release buckle for a more comfortable shooting experience. Buckle: Plastic. Designed to be worn across a right-handed user's body, draped from the left shoulder to the right hip. The complete warranty is included with the product. After this period you need to use the manufacturer warranty. Effective option for larger-build photographers who intend to move quickly whether on flat or rugged terrain. International Orders - We usually do not accept international orders. New Arrivals. Also provided is a BlackRapid FR-5 FastenR Breathe for every carabiner. One strap can be worn across a right-handed user's body, draped from the left shoulder to the right hip, while the other can be worn across a left-handed user's body, draped from the right shoulder to the left hip. FR-5 FastenR Breathe. The FR-5 FastenR Breathe is constructed from stainless steel with a nylon coating for durability. An included rubber washer can be used to prevent overtightening during installation to a compatible tripod mount. TheTripod Plate 50 fromBlackRapid is a 50mm Arca-Swiss type Quick Release plate. Tripod Heads & Supports. Material: Aluminum alloy plate and stainless steel D-ring screw. Gear Protection. Tethering Tools. Also provided is a BlackRapid FR-5 FastenR Breathe for every carabiner. BlackRapid Hybrid Breathe Strap. JZS CC-20 Microfiber Cleaning Cloth. Integrated BRAD. Webbing: 100% Nylon. Webbing Width: 0.9". Flash & Lighting. Tripod Heads & Supports. Tethering Tools. Photo Accessories. iPhone & iPad Photo Gear. Gear Protection. Demo Delights. Width of Webbing: 0.4" (1 cm). BlackRapid Wrist Strap Breathe. FR-5 FastenR Breathe. JZS CC-20 Microfiber Cleaning Cloth. Comfortable Nylon Webbing. Material: Soft nylon webbing. The Wrist Strap combines the ConnectR hook with a smooth, comfortable, and secure wrist strap. Compatible with most standard tripod socket; ariaprene shoulder pad; nylon webbing and TPE foam material; adjustable length; connector CR-4; Lock Star; fastener FR-5; polyester dust bag. Fastener FR-5. Nylon pouch for storage and transport. Buckle: Plastic. Weight 4.5 oz (127.6 g). Width of Webbing: 1.0" (2.5 cm). 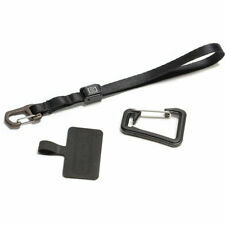 That extension strap features a male side-release buckle on one end and a female side-release buckle at the other. Adjustable 36.0 to 70.0" length with 1.0"-wide, nylon webbing. Webbing: Nylon. Width of Webbing:1.0" (2.5 cm). Nylon pouch for storage and transport. Designed to be worn across a right-handed user's body, draped from the right shoulder to the right hip. Sport Right Breathe. The complete warranty is included with the product. Locking Carabiner- Brass and zinc alloy. Flash & Lighting. Tripod Heads & Supports. Tethering Tools. Photo Accessories. iPhone & iPad Photo Gear. Gear Protection. Demo Delights. TheTripod Plate 70 fromBlackRapid is a 70mm Arca-Swiss type Quick Release plate. Tripod Heads & Supports. Material: Aluminum alloy plate and stainless steel D-ring screw. Gear Protection. Tethering Tools.